Bo’ness United midfielder Ross Philp felt their performance against title-chasing Kelty summed up their season – a story of missed chances. 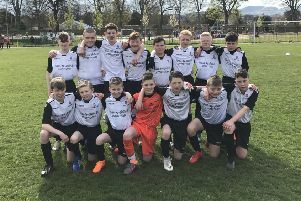 The BUs’ Super League hopes took a major blow on a day in which unbeaten Kelty took a step closer to the title as their nearest rivals for the crown, current champions Bonnyrigg Rose, slipped further behind in the race. And who could have any complaints if Tam Courts’ men seize back the title, which they won for the first time in their history in season 2014/15? Kelty are at the league summit on merit and, although they might not be the most stylish team on the park, their current 18-game unbeaten run is one to be admired. Bo’ness are now 22 points behind after the Fifers made it nine away victories in a row but former Kelty man Philp felt they matched the runaway leaders. “I thought we did alright against them considering they are flying and they shouldn’t even be thinking about getting beaten,” said Philp. “We played quite well and seemed to match them up. “Apart from the first ten to fifteen minutes of the second half, we were on top. Even when they went 2-0 up I thought we came back into the game well. “I think we had to take our chances in the first half. “It’s disappointing because you want to put a wee bit pressure on them because nobody else looks like beating them either. “It’s the story of our season. It’s just that last wee touch or hit to get the ball in the net when we are on top, then the other team goes up the park and scores. We knew they were going to come out like that in the second half but for it to be from a corner and a free-kick was disappointing. A minute’s silence was held prior to kick-off as a mark of respect to 30-year-old former Bonnyrigg Rose player Shaun Woodburn – killed during an incident in Leith on Hogmanay – and ex-Broughty captain Lee Bertie, who recently lost his battle against motor neurone disease aged just 39. Just 12 minutes into the match, the home side were rueing a missed penalty. Right-back Craig Thomson felled Marty Wright in the area, presenting Will Snowdon with the chance to take the lead for Bo’ness, but his spot-kick was halted by Kyle Marley. Philp then had a fierce first-time effort cleared off the line by former Hearts player Thomson after Marley had flapped at a free-kick hoisted high into his area. Midfielder Wright was next to come close after he got on the end of Jack Simpson’s ball from wide on the right, but he sent his header narrowly wide. With home keeper Charlie Clark yet to have a save to make, the visitors raced into the lead three minutes after the interval. Former Clyde striker Archie Campbell pounced on a loose ball after the home side had failed to clear a corner and he rattled the ball home low through a ruck of bodies. Philp almost saw his deflected effort dip over Marley and into the back of the net as the home side looked for a quick response, but Kelty hit them with a knockout blow on 57 minutes as Thomson curled an expertly-taken free-kick round the wall and past Clark to make it two. Stuart Hunter should’ve hit the back of the net with a header to reduce the deficit and, although the BUs pulled one back through a Robert Sloan penalty with ten minutes remaining, they never looked like scoring a second. Bo’ness assistant boss Steve Pittman felt his side were the better team but rued their profligacy in front of goal. He said: “I thought we dominated the game. We caused them all sorts of problems in the first half hour but we just couldn’t get the goal. If the penalty went in it might’ve been a completely different game. “The game was about taking chances. We had four or five really good chances in the first half and we didn’t take them, while they never had any. “We got punished for not taking our chances. They got one opportunity and they scored from it, then they got a free-kick which I didn’t think was one. Bo’ness United: Clark, Snowdon, Devine, Campbell, Hunter, MacLennan, Simpson, Philp, Keast, Sloan, Wright (Eddington). Kelty Hearts: Marley, Thomson, C.Courts, O’Neil, T.Courts, Husband (Jacobs), Ritchie, Greig, Dalziel (Moore), Cargill, Campbell (McCabe).